Note: this article was originally published on April 26, 2013 as the third installment of my six part series for Mismanaging Perception on the unsuccessful campaign to fluoridate Portland’s water supply. Alberta Street saw upwards of 700 clean water lovers take to the streets Thursday in opposition to fluoridation chemicals being added to fresh Bull Run tap water. The heated campaigns for and against fluoridation have been waging an all out war, though the pro-fluoride side has received far greater big-money donations from large business interests. 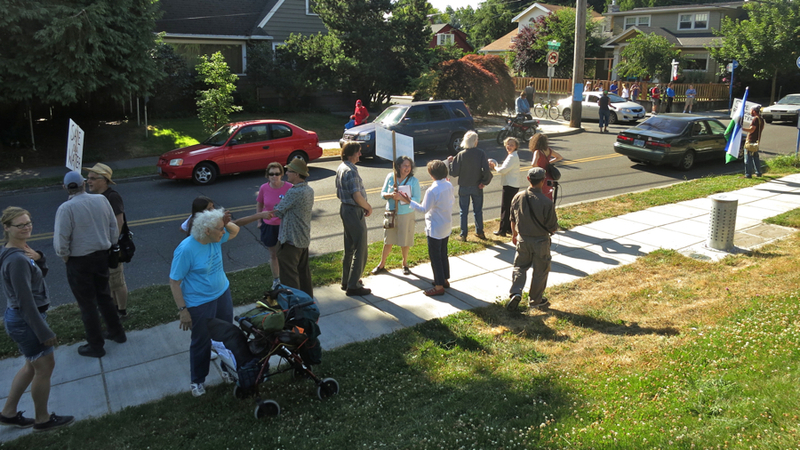 Gathering at the offices of Clean Water Portland, a mass of bicyclists kicked off the festivities early. Crossing the Willamette River, the riders stopped for a group photo in front of a new three-story tall billboard urging citizens of Portland to vote NO to fluoride chemicals next month. Ballots go out May 3rd and are due by May 21st. From here, the ride pressed north to the monthly Alberta St. ‘Last Thursday‘ arts fair celebration, where hundreds of Portland voters peacefully and legally marched the length of the street flanked by lively mobile music courtesy of the perennial March Fourth Marching Band and the aptly titled LoveBomb Go-Go Marching Band. Note: this article was originally published on April 11, 2013 as the second installment of my six part series for Mismanaging Perception on the unsuccessful campaign to fluoridate Portland’s water supply. Observing the filled room, it wasn’t hard to notice that Clean Water Portland’s bright-blue ‘No Fluoride‘ buttons and shirts outnumbered “Healthy Kids Healthy Portland” blood-red buttons about 5 to 1. It seemed the audience present might already be in favor of continuing Portland’s 60 year tradition of rejecting fluoride of their drinking water. Representing the pro-fluoridation side of the night’s debate was ‘Healthy Kids Healthy Portland’ (HKHP), a PAC formed after activists collected twice the required signatures to move city hall’s fluoride vote into referendum, granting the public a voice on whether fluoride will be added to their drinking water. The effort that gathered a staggering 43,000 signatures last fall was spear-headed by Clean Water Portland (CWP), who were on hand to present the anti-fluoride side of the evening’s debate. This article was originally published on Blue Oregon. This September, a few noteworthy news stories broke that seemed to escape public consciousness. One was on Portland winning global honors for it’s Climate Action Plan. There’s just one problem with his words here. When contrasted to other statements Hales has made, they ring totally hollow. In protest of an EPA mandate to bury Portland’s historic water reservoirs, activists and organizers together with the neighbors of this city launched Camp Cascadia at the base of Mt. Tabor last Friday. After years of stagnation from City Hall in procuring a waiver to the plan know as ‘LT2’, the people of this community have had enough. After considerable media hype over the so-called ‘Occupy Mt. Tabor’, Camp Cascadia has turned out to be a consummate success. As covered previously by Rebel Metropolis, the waiver to LT2, similar to a deferment that New York City received, has so far eluded Portland. While LT2 is a federal mandate, city hall has the authority to request the waiver from either the EPA, the Oregon Health Authority, or a congressional delegation. City Hall alleges making such a request years ago, however, current mayor Charlie Hales has yet to engage in any effort to secure the waiver. Unfortunately, Charlie Hales may also have a serious conflict of interest with LT2, as his former employer HDR stands to profit from the overall plan – one which activists assert is the tip of the iceberg in a much larger plot to privatize the entire regional water supply. Joe Glicker, a former water bureau engineer and current head of CH2M Hill also has a major behind-the-scenes roll that has allowed him to get rich off the LT2 plan. So it was out of this frustration and breach of bureaucratic trust that Camp Cascadia was born. 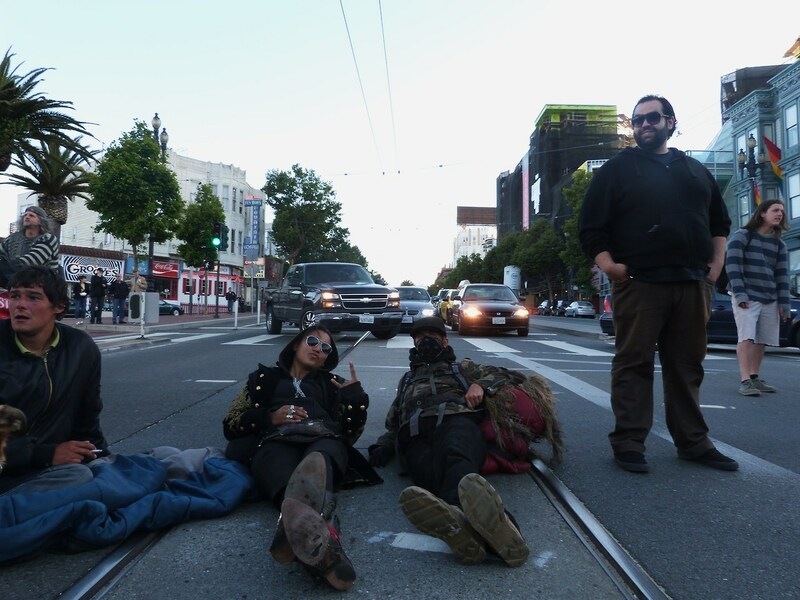 Initially organized by long-time direct action activists Jessie Sponberg, Micaiah Dutt, and Jess Hadden, the input and direction of the camp was shaped by an ever increasing group of individuals eager to lend their skill and support. A showdown is about to happen on Mt Tabor. 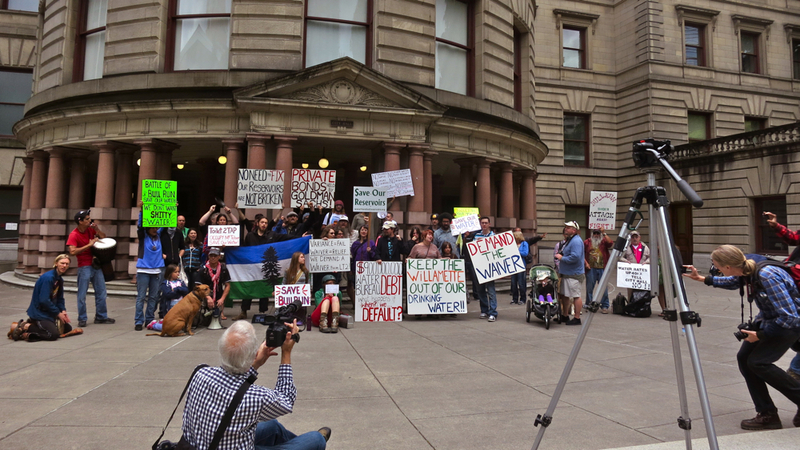 Activists and neighborhood organizers are preparing to set up Camp Cascadia in protest of city hall’s failure to secure an LT2 waiver to the costly mandated burying of Portland’s historic water reservoirs. 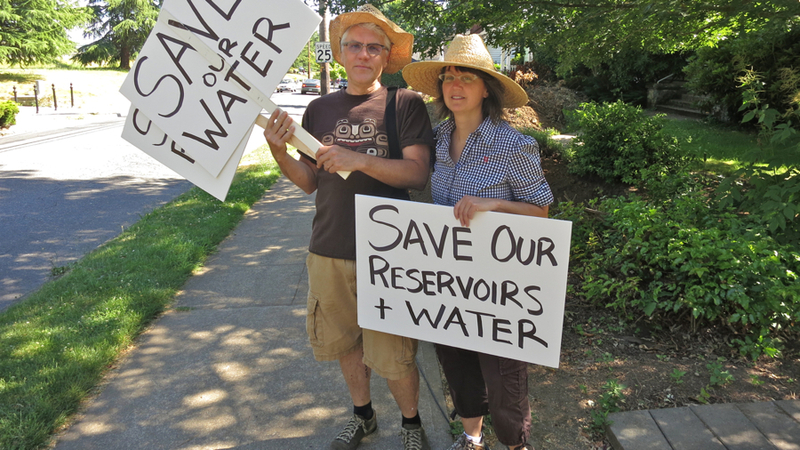 According to organizers, this protest is about far more than just the reservoirs themselves. This is about the quality of the Bull Run tap water, this is about citizen rights to the city itself, and this is about the potential privatization of our entire regional water supply. There is much at stake. Starting this Friday, the progression of events in this struggle will chart a new course. 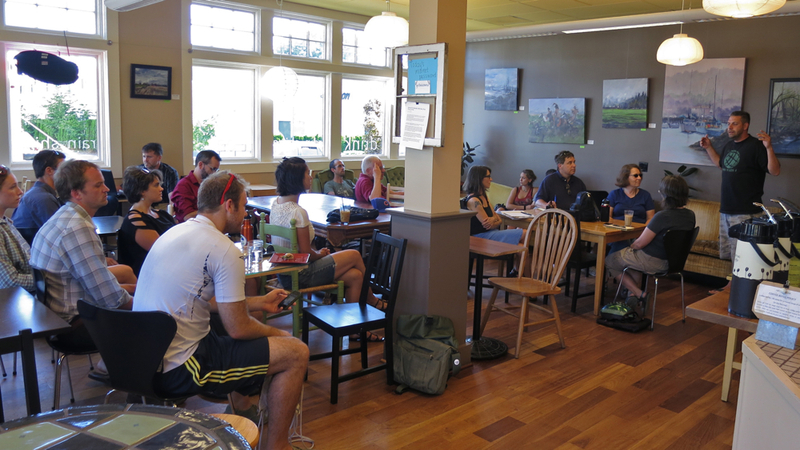 At a recent community meeting at Rain Or Shine Coffee House, about two dozen concerned citizens were informed on the issue, and discussed last minute logistics for the upcoming occupation. Speakers stressed the fact that the city has not actually requested the LT2 waiver from the EPA or the Oregon Health Authority. They also urged people to contact key political players involved that could halt the dismantling of the Tabor reservoirs; mayor Charlie Hales, commissioner Nick Fish who oversees the Water Bureau, and Senator Jeff Merkley, who has unfortunately indicated his stance is drawn from that of city hall. Possibly the most famous closing line to a film, the last utterance of Roman Polanski’s neo-noir Chinatown was meant to convey the sense that no amount of truth-telling or investigative light-shining can stop corrupted bureaus of city government. For anyone who hasn’t seen the film recently or isn’t familiar, Chinatown is loosely based around the real life Los Angeles ‘Water Wars‘ of the 1930s. At the time, LA was rapidly expanding, and property speculators stood to make big bucks on real estate. They had but one problem; LA is practically a desert.